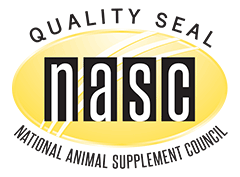 National Animal Supplement Council Quality Seal | Wapiti Labs, Inc.
What is the NASC and why is it important to see their label on the supplements you feed your pets? What Is the NASC?Wapiti Labs isn’t just dedicated to providing the highest quality elk velvet antler, but we’re dedicated to providing the best overall animal supplements to all animals. We believe that our supplements are the best for your animal through all stages of life and so does the National Animal Supplement Council. Stamped with their quality seal, Wapiti’s products bring rejuvenation and well-being to your pets and you. Since its inception in 2001, the NASC has been dedicated to issues surrounding health supplements for cats, dogs, horses, and companion animals. As a nonprofit, the NASC has been pioneering the health of companion animals that are given animal health supplements. They’ve worked tirelessly to establish fair, reasonable, responsible and consistent state and federal regulations in regards to animal health supplements. Who Is a Part of the NASC? The NASC is comprised of stakeholders who are concerned with the supply of animal health supplements. NASC members stretch from big manufacturers to hometown veterinarians as the care and well-being of animals pertains to all of them. The common thread relating all members of the NASC is an overwhelming desire to assure the health of animals—this value aligns with Wapiti’s goals. Our story begins with the admiration of elk and the quest of a father and son to start their own ranch. Through this venture, Wapiti Labs was created with deep roots seeded in the goal of providing the best natural pet supplements. Not only does Wapiti Labs want to take the best care of your pets, but we also aim to take the best care of our elk. Situated in Sturgeon Lake, Minnesota, Wapiti’s elk breathe the fresh air of broad grazing lands and a wooded oasis. What Does the NASC Do? The NASC is responsible for establishing Good Manufacturing Practices for quality assurance and product safety across all of its members. The NASC Seal of Quality means you can trust that that particular animal health supplement was manufactured using best practices, meets our high quality standards and will aid your animal’s health and well-being. The NASC holds its members to strict quality standards and achieving the Seal of Quality is no easy feat. By conducting ongoing research and development, the NASC is always evolving to ensure your animals will consistently receive the best supplements possible. Buying a product stamped with the NASC Seal of Quality means you’re buying from a reputable manufacturer that meets and exceeds standards of quality. The NASC works with the Food & Drug Administration (FDA) Center for Veterinary Medicine (CVM), state regulators, and regulatory policy associations such as the Association of American Feed Control Officials and the Veterinary Drugs Directorate. With solidified working relationships and cooperation, the NASC, in conjunction with these agencies, can create the dream of consistent and transparent animal health supplement regulations. Before the NASC came to be, there wasn’t a legal category for animal dietary supplements, causing regulatory bodies to consider removing all of the products in this category from store shelves. Since its creation, however, the NASC has grown to more than 125 companies within the U.S. and abroad. Because of such full and comprehensive cooperation across several industries represented by our members, animal dietary health supplements can be safely manufactured and offered to your pets. Why Wapiti and the NASC? Wapiti Labs is and always has been staunchly dedicated to the care of both pets and their elk. From our glorious pastures to your pet’s vitality, Wapiti adheres to the same pet-based morals of the NASC: the care and well-being of pets. Wapiti Labs Elk Velvet Antler Co. has ceaselessly passed rigorous audits testing manufacturing practices, quality and other remarkably high industry standards. We believe pets deserve the best—and Wapiti dietary health supplements are the best. We craft our products in the U.S.A., right where our elk are raised. Elk Velvet Antler is a sustainable natural health supplement harmlessly harvested from our elk under direct watch of our personal veterinarian. We’re endlessly committed to the health of your dogs and cats; you’ll see evidence of our dedication with our natural ingredient lists, proven benefits and the NASC Seal of Quality applied to all of our animal dietary supplements. With more than 125 members adhering to the high-quality standards of the NASC, you’ll always rest easy with the peace of mind the Seal of Quality brings with it. Wapiti is proud to be able to offer your pet’s health supplements that fulfill and exceed the staunch regulations of the NASC as it means we’re truly providing you with the best supplements possible. Elk Velvet Antler has insurmountable benefits through our natural ingredients. If you’re searching for supplements for your dog or cat, Wapiti Labs can help you. Our hearts go into crafting supplements that will help your pet’s live longer, fuller lives through natural rejuvenation. Our eco-friendly commitment to sustainable sources and elk that are cared for in the best way possible will never wane—you will always be getting the best from Wapiti and out NASC Seal of Quality. Is your senior dog moving a bit slowly lately? Try Wapiti Labs’ Senior Mobility Pet Supplement for Dogs! If you’re searching for the perfect supplement to keep your senior dog healthy long into old age, try our Senior Mobility Supplement for Dogs today! Is a Vegan Diet Right for Cats? Should You Invest in Strength Supplements for Your Cat? Subscribe to our Monthly Newsletter TODAY! Check your inbox monthly for Specials, Educational Pieces and see what is New at Wapiti Labs and the Wolf Creek Elk Ranch! © 2019 Wapiti Labs, Inc.